Should I Let My Lawn Go Dormant? You can reduce watering bills, chores, and conserve water by allowing your lawn to go brown. In times of drought or in late summer, one option to save water is to allow your lawn to go dormant. Lawns are large, thirsty plantings and not watering them can really reduce water usage. The big downside is that you have to look at a brown or largely brown lawn. The blades (leaves) of the grass die, but the roots stay alive to green up again with fall rains or in the spring. First, do not bring your lawn in and out of dormancy--that is, let it go brown and then water it to green it up and then let it go brown again. This stresses the grass, encouraging sparse turf and insect and disease problems. Some lawns endure extended periods of drought better than others. 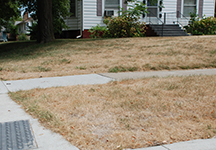 Almost all Iowa lawns are cool-season grasses can survive several weeks without water. But drought-tolerant warm-season grasses, such as zoysiagrass, can go far longer. (Unsure if your lawn is cool-season or warm season? You can tell by when it greens up in the spring. If it starts to green up soon after the snow melts, it’s a cool-season grass. If it waits until April or even May, it’s a warm-season grass. Click here for more information. Once a lawn is dormant, it typically takes two applications (or rains) of about an inch each to green it up again.